Hock Heng Stone Industries Bhd through its subsidiaries is engaged in manufacturing and sale of dimension stones and related products. Its business activities include sourcing, processing and distributing a wide range of dimension stones including granite, marble, sandstone, and slate. Hock Heng’s products are mainly used for a wide array of applications in the commercial and residential properties, such as façade walls, flooring, staircases, monuments, furniture, pillars, garden sets, and landscaping. The company’s segments include Sakes of goods; Construction; and Development properties. HokHeng supported at 0.70 and for past few days its have been generating high volume compared with average daily volume. 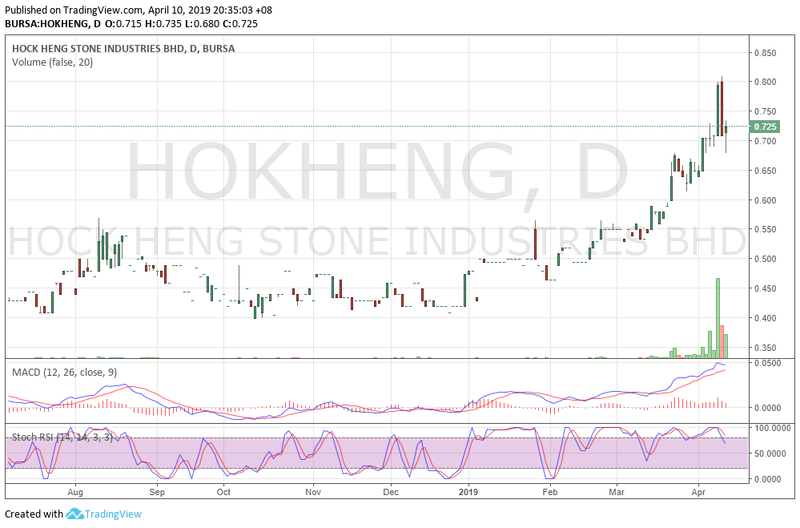 On 9th April, HokHeng hit 52weeks at 0.81 and retraced towards 0.71. A highlight we want to mention today is HokHeng's Direct Business Transaction. 40.911% of market shares transacted at RM1.00 and this means it triggers MGO too. However, no any news is out yet for the time being. So, we wan't to update you guys as soon as possible what had happened on this HokHeng. Last minute huge buyers on 0.725 too. Most probably tomorrow many will notice this big shares transacted on this company. Last but not least, lets wait for the news out for further details.